Imagine earning a bachelor’s degree from the University of Virginia almost entirely on Tidewater Community College’s Virginia Beach Campus. It can be done thanks to a partnership between TCC and the University of Virginia. “Thanks to this program, I’m going to graduate from one of the most prestigious universities in the country,” said Lonnie Elrod, Jr., who earned his bachelor’s of interdisciplinary studies in December 2013. TCC and the University of Virginia offer an adult degree completion program exclusively for TCC students. 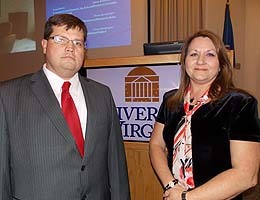 The program is geared toward the adult student with 60 credits of transferable college work, 15 of them from TCC, prior. Students must be at least four years removed from high school. Kennedy enjoyed the diversity of classes in business, humanities, social sciences and the liberal arts – “everything from emotional intelligence to African-American dance to history to classes in history, religion and politics,” she said. Classes, all taught by University of Virginia faculty, are in the evening to accommodate working students. Some classes can be taken online, and those are virtual. Lewis, who has an office on the Virginia Beach Campus, holds several information sessions during the year. “We make sure the education they’re getting here is comparable to what they’d be getting on-grounds in Charlottesville,” she said. Students are required to be in Charlottesville for one orientation and again for a library lesson. Each student is assigned a peer mentor to facilitate the process. Shore to complete the program. The program’s interdisciplinary nature makes the focus on critical thinking, decision making and communications. Often the students in the program need a bachelor’s degree to advance professionally. Some need the additional college credit to apply to graduate or law school. The final semester of the program requires students to write significant research papers and present them. Last fall’s Capstone Project topics ranged from the impact of Homer’s work on ideas of virtue in the Classical Age to nutrition education efforts in low income communities to the academic excellence and subsequent failure of Northampton County public schools. Interested in the program? Attend the next information session on Feb. 5 at 6 p.m. in Building A, Room 211 at the Portsmouth Campus. Additional sessions will be held throughout the spring semester. 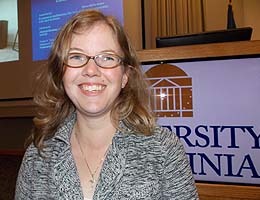 Students can also email Lewis at pbl5e@virginia.edu or call her at 757-822-7486.